Be aware of all that you are. Two of today’s most sought-out spiritual teachers met in Maui in November, 2011, to talk about the nature of consciousness. 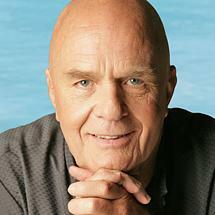 Dr. Wayne Dyer and Eckhart Tolle give us their views on the importance of moving beyond an ordinary view of ourselves, reconnecting with our divine origins, and rediscovering our role in the well-being of the world. Wayne: Most of us were raised to believe we are ordinary. We aren’t raised to believe in our extraordinariness, our divinity. This ordinary part of us, the ego, is the part that insists that we are what we have, what we do, what other people think of us. It tries to convince us we are separate. In truth, we are born perfect and then snatched out of that perfection and programmed into accumulating and achieving. We never get back to the extraordinary part of ourselves because the ordinary part thinks we are having a successful life. But beyond ordinary is the extraordinary—what we call the “soul.” That formless, invisible, birthless, deathless, infinite part of us only wants to expand and grow. We need to address this infinite, no-limits part of ourselves. Wayne: The great saint in India, Muktananda, was asked, “What is real?” He replied, “What is real is that which never changes.” When looking for what is real and unchanging about ourselves, we can apply this definition. Who are we? We certainly aren’t our bodies because those are changing constantly. So the real you is that which keeps occupying new bodies—from infant to toddler to teen to adult. There is an unchanging spark from the Creator in each of us, our highest self, a piece of God. And we are all connected. Eckhart, when I saw you in conversation with Oprah recently, I realized how important it is for all of us to be “aware” and living from an “awakened” state. We have an impact on every person we encounter. Eckhart: All the people you encounter will be impacted. Your state of consciousness gets transmitted to others. One negative person can create a chain reaction of negativity in others. In the same way, a conscious person can dissolve streams of negativity. You affect the underlying collective field of human consciousness. I feel sure that you affect countless others that you never even meet, the collective consciousness of humanity. Wayne: All life is connected so the whole universe can be impacted. The poet T.S. Eliot said, “We shall not cease from exploration, and the end of all our exploring will be to arrive where we started and know the place for the first time.” He may have been talking about death, but I think we can arrive at knowing our divine nature without having to die. Eckhart: This reminds me of the parable of the Prodigal Son, from the Bible and other ancient sources. The son demands his inheritance and leaves home only to become destitute. This is the story of humanity, humanity losing itself in externals, losing connectedness with the Source of all being. Not totally losing the connection, but becoming unaware of it. So we become beggars looking for scraps, seeking fulfillment in houses, cars, new partners. This is the condition of the person who has lost awareness of the Source and our oneness with all beings. When the prodigal son returns to his father’s home, he appreciates at a deeper level something he had lost. Wayne: Speaking of the Prodigal Son, Eckhart, I don’t know if it’s your story but it is mine. I’ve gotten lost several times and each one has been a way for me to recognize that all spiritual advances are preceded by a fall of some kind or another. The storms of my life have brought me back to God.